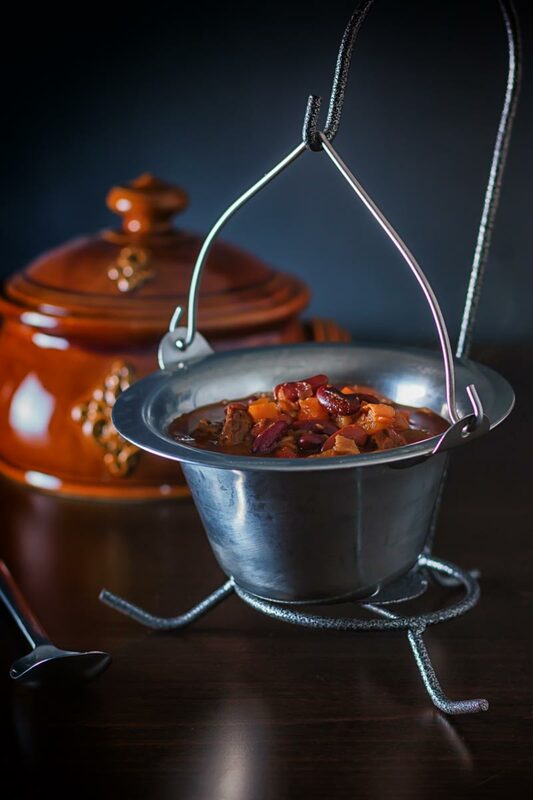 It is impossible to get more Hungarian that Gulyás or Goulash as some folk say, this Hungarian Bean Goulash is loaded with beans, beef and of course paprika! 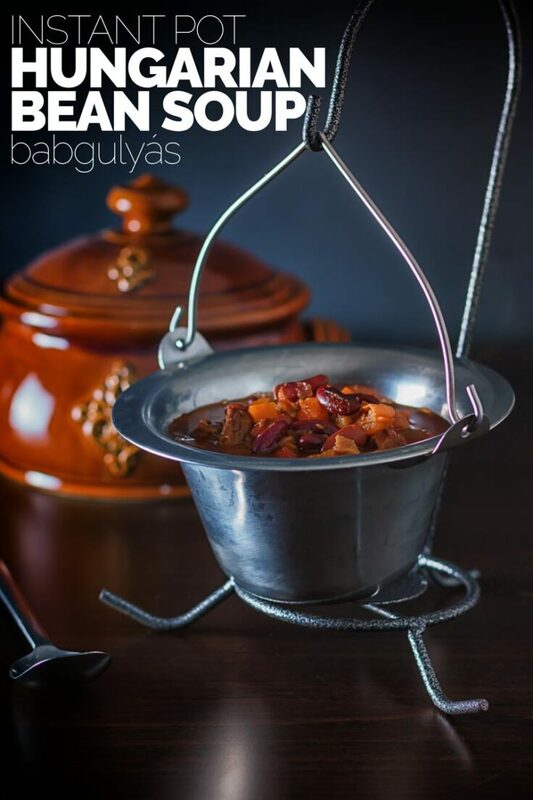 My first recipe here on Krumpli was a Gulyás or as you probably spell it Goulash, there is nothing more Hungarian when it comes to food as a Goulash and this bean goulash or Babgulyás as it would be called here is a staple on restaurant and home tables alike. 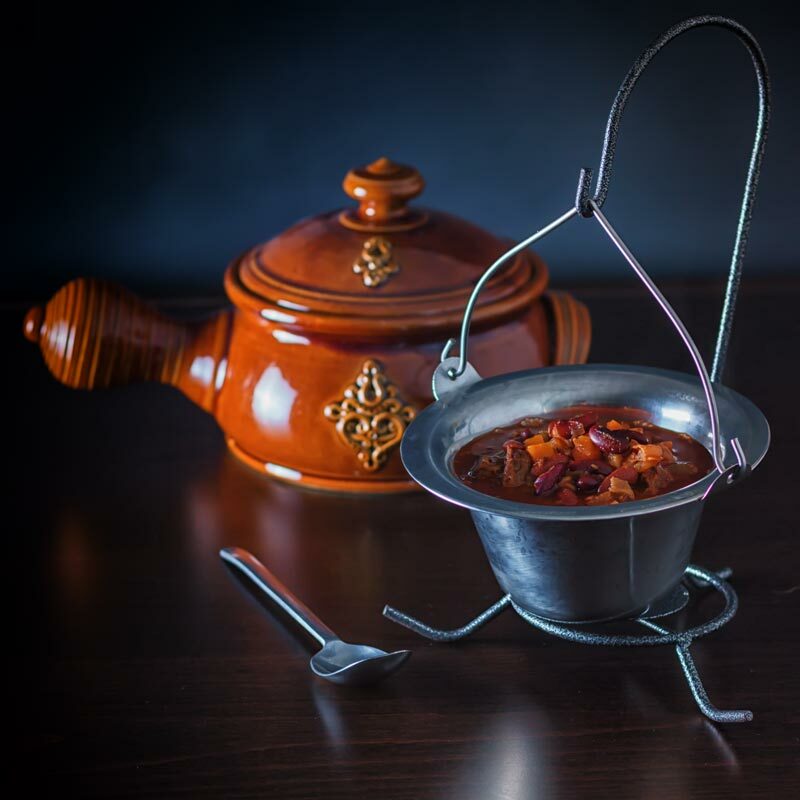 When you make a trip to a Hungarian restaurant or even better when you are invited into a home you will not get what 99% of the internet call goulash because it is in a fact a soup and not a stew and certainly not a pasta dish with minced meat. Like most Hungarian cooking the flavours in the bean goulash are pretty simple, although I have added a couple of bits you would not normally find in a goulash like celery this remains pretty ‘authentic’. 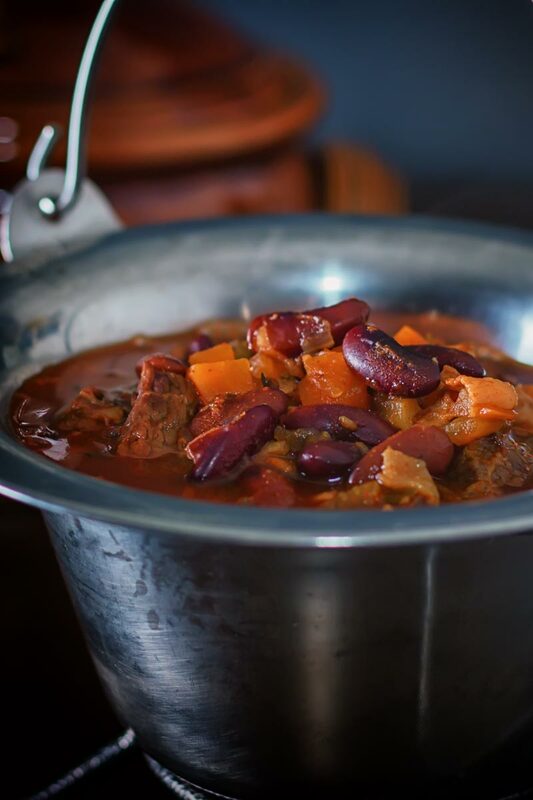 It was fun developing this recipe bean goulash for my Instant Pot and really rather simple, you could of course chop you vegetables larger and cook this in one setting. I have tried it and had limited success but for me it is not the result I want for either. I have to say babgulyás has become a bit of a running joke in the village I live in, as I have mentioned it is a small place with a population of just 180 people and every year we have a ‘village day’. A pretty standard affair by Hungarian standards and the population for that increases five fold for that day, lots of booze is consumed, loads of terrible music and much falling over. It is fabulous but without question every single solitary year the food consist of bean goulash, now it is free and for all of the wise cracks and jokes the queue is always long but you can bet you last penny on it, it will be bean goulash on the menu again this year. 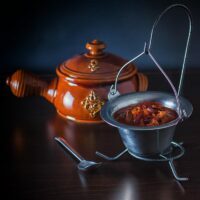 Gulyás or goulash is as near as damn it the defining dish of Hungarian cuisine... But it is not a single dish but a 'spectrum' of simple and hearty soups flavoured with lots of paprika. This version is a Hungarian bean goulash and as you would expect it is a real hearty treat! Set your InstantPot to saute mode and when warm add in the bacon stirring continually. When it has created a nice layer of bacon fat add in the onion and celery and saute for 5 minutes. Now add in the garlic, caraway seeds and thyme and stir for 1 minute. Then add in the beef and stir and saute for another 5 minutes before turning off the saute mode. Now sprinkle over the paprika and stir before adding the tomato puree, beef stock and bay leaves, once all combined have a quick test for seasoning and add salt and pepper as required. Place on the lid and cook on manual high pressure for 8 minutes. Then quick release the lid and add in the diced parsnip, carrot and beans, again replace the lid and cook on manual under high pressure for 5 minutes, now is also a good time to check that seasoning again adding salt and pepper as required. Allow a 10 minute natural pressure release and serve steaming hot. Just finished cooking this and OMG it’s so delicious . So glad you love the flavours Teodora, the only thing I can think of with your beans is that you are using uncooked beans? The recipe calls for cooked beans you can either cook them in the IP for 12 minutes before hand or used canned beans. 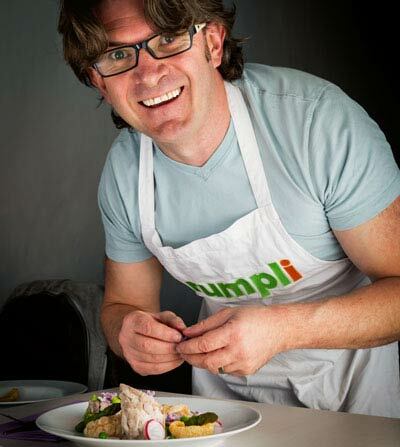 How did you know Brian that you should use caraway seeds for this dish and not cumin?! I was desperate for a long time here in England that I never got the taste of köménymag moreover I ruined my gulyasleves completely with your cumin. We all know Gulyás is made with caraway seeds and not cumin right 😉 Hehe, I asked questions and watched people making Babgulyás at village days really. I hope you have found them by now, if not try in North African or Persian stores as they are very popular in that style of food. Oh I really need to try this before the weather becomes *too* Spring like for me to bare another stew! It looks fantastic and I love your traditional little pot to cook it in. Man, I’ve really got to get myself one of those! I am in LOVE with my Instant Pot and make beans in it all the time–I am going to have to give this recipe a try! That instant pot sounds like a great gadget and this recipe sounds so hearty and delicious. I love how easy it sounds. What a hearty dish! Winter isn’t quite over yet so I’ll absolutely have to make a big batch of this during our next cold front! That sounds like a fun village day. If the bean goulash is as good as this one, you are one lucky bunch of people. lovely photo’s, this goulash recipe looks wonderful. This recipe sounds really great for cold days. I absolutely love beans and the nutrition and fiber that they pack. Would love to try this!